I'm linking to Throwback Thursday and I wanted to share some of my Halloween posts from the past. My sunflowers and mums were beautiful last year. Mr. Crow and Miss Kitty are enjoying a cup of tea in one of my favorite tea cups. The cute lighted houses, mice and ornaments on my Halloween tablescape. Love the Halloween colors. Black, Black and more Black. Watch out for the mice. October wouldn't be complete without a bucket of mums. Cupcakes and Bats make a yearly appearance. 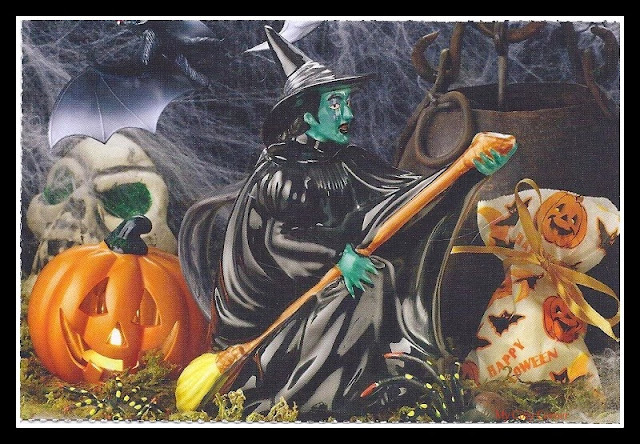 Thanks for visiting My Cozy Corner as I showcase some of my Halloween posts from years past. I love looking back and enjoying old posts. Love your black cats. They are so cute, perfect for a Halloween tablescape. The cupcakes are totally darling. Thank you for sharing. I am your newest follower. I am looking forward to reading more of your posts. Fab Halloween decorations for the table. My daughter would love the little houses too! Discovered your blog via Throwback Thursday. Believe it or not, what caught my eye was your chintz teacup. *smiles* Lovely mums and your cupcakes are really cute. Thanks for sharing at my HOME and enjoy your weekend.